Sunday, we ran with about 8,500 people in the Eugene Marathon and ½ Marathon, about 85 of those (or .01%) happened to be my co-workers. 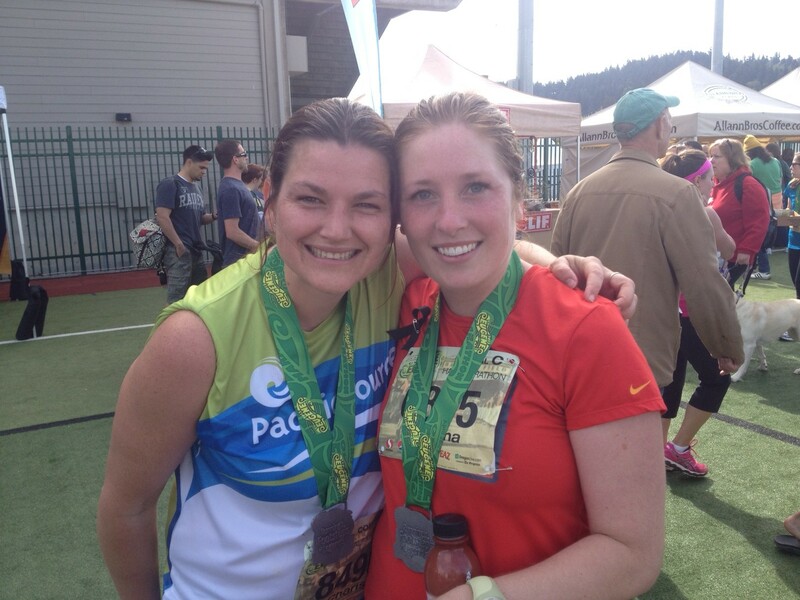 The Eugene Marathon has become quite the tradition for PacificSource employees. 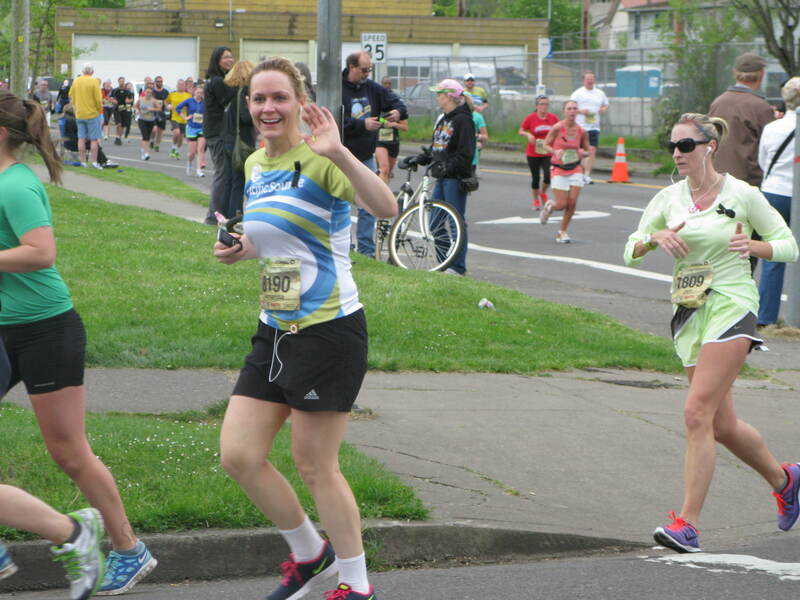 Every year, we sport our team shirts, and flood the streets of Eugene with runners and walkers. And, based on some unofficial t-shirt size reduction research-we are getting healthier every year. To paint a picture of how great the day was, a few PacificSource bloggers captured some of the sights, sounds, and feelings from the day. It’s hard to reproduce them for a blog, but we gave it shot! This is our story (as we remember it). I was in one of the hundreds of porta potties (while my speedier friends went in the bushes to avoid getting stuck in the lines) when the elite runners crossed the starting line. That’s okay because I was in Corral C, meaning it takes about 7 minutes before my wave crossed the start line. However, in a decision I was sure I would regret later, I sprinted back to catch the opening festivities. Did I do enough track work for an extra 50 yard wind sprint? Only time will tell. No time to ponder now, it’s go time! The first mile is always really congested, and my running partner was worried about our split times (that is running talk for “how fast we run each mile”). While she was anxious, I was enjoying the leisurely warm up and couldn’t take my mind off of the discarded warm-up gear randomly scattered throughout the first mile. Will those runners ever get their nice dry fit shirt back? Do they have someone stationed to pick it up for them, or is it just a causality of the race? You have time to think in mile 1, as long as you remember that you also have to be agile to sidestep a race cone or another runner. The crowds were amazing; some of our non running co-workers were out on the course with personalized signs. As anyone in the race could tell you, it’s amazing how much support and energy you harness from the crowds. It was also motivating to see members of your own team throughout the course. Going South on East Amazon and seeing our teammates with PacificSource shirts, 2 miles ahead of us already going North on West Amazon. How the heck did they get so far ahead!? However, Seeing their smiles and cheering them on helps them as much as it helps us to know we can do it too! The course is remarkably flat compared to other marathon courses. But there’s a nasty hill in the middle (I’ll get to that later). But people always forget about the sneaker hill at mile 4. It’s a tricky little bugger. Mile 4 had an up-hill, and down-hill that we failed to account for. But after we knocked it out, I had an adrenaline rush after getting through this mile. Favorite Fan Sign, “Your Training Program Lasted Longer than Kim Kardashian’s Marriage” Also, I had a chance in mile 5 to run with a co-worker that had never run more than 6 miles…so great to see the smile on her face!!! Mile 6: Or was it? Did we skip one? Sometimes the miles just fly by unnoticed. We discussed being excited to be approaching Mile 6, and were more excited to realize it was Mile 7! Somehow we had breezed through an additional mile without even noticing it. This is the hill I was talking about earlier. This is where you can draw strength from those who have had so much more battle in them than I will ever know. They have tributes along the hill for those we have lost to cancer. Personally, it helped me keep my struggle with the hill and the miles in perspective. Plus, this is a spot where the spectators line up on both sides. They literally drive the runners up the hill. It’s pretty awesome. 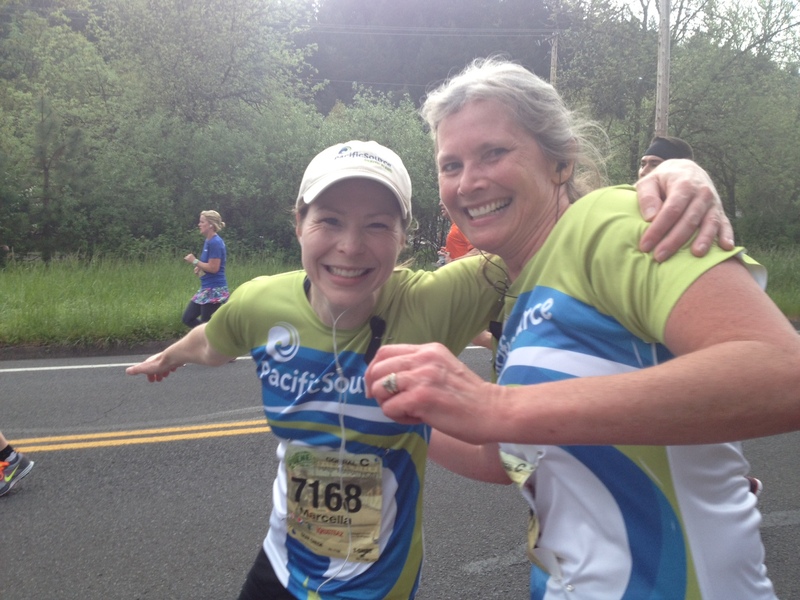 Two spectators notice our shirts, and yell “Go PacificSource! You’re my insurance company. Thank you for helping to keep us healthy.” Our shirts were easy to spot this year, and they oozed with the “snazz” factor. Hey Only a 5 K left right? You won’t be out here much longer now, you can do it. Hey, there is food and water waiting for you at Hayward. Am I a warrior? You know it! 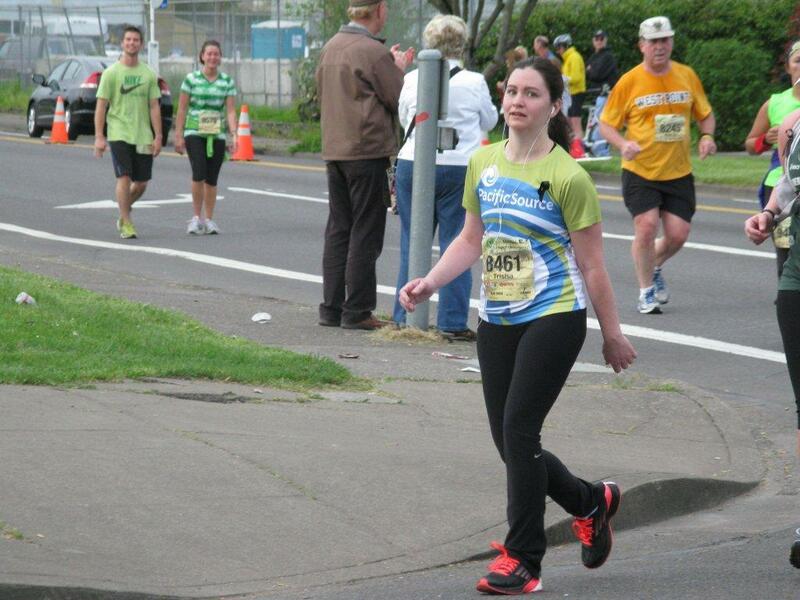 At this point in the race, I was really tired. But, just as I was starting to doubt that I had much left, there was a cheerleader behind me that just started hootin’ and hollerin’ and telling us that we are at the end and how awesome we all were! This cheerleader was a lifesaver! Mile 12: Man, I’m glad I trained for this thing! This is where my track workouts paid off. I knew that I could run a final four laps (that’s the equivalent to one mile on a track) and then I’d be entering historic Hayward Field. I turned up my music – LOUD – and went for it. I figured, I’d come this far, what’s another mile-ish? One foot in front of the other, one foot in front of the other, one foot…. Yay the crowd is back, and I have 200 meters to go…WOOOHOOO!!! “Hand on your Heart, remember to put your hand on your heart for Boston” that was our mantra during many of the 13 miles” Most of my co-workers and friends did remember. 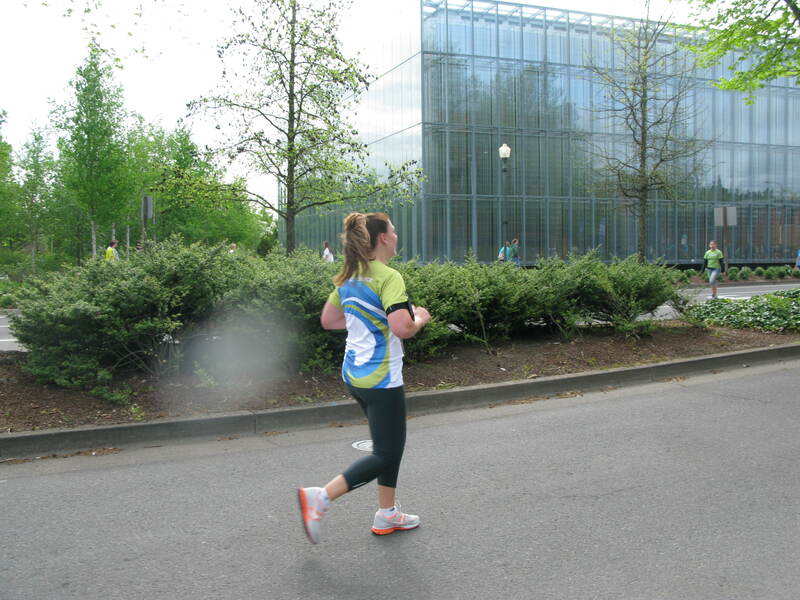 Having had co-workers and friends run in this year’s Boston Marathon, we felt honored to pay tribute to the race. Boston, you were in our hearts and on our mind. Love from Track Town USA. I just can’t believe there are people crazy enough to do 26.2 miles! Maybe next year. Having community support is so important in leading a healthy life. Completing a race like this one gives you a number of gifts, including a sense of accomplishment! We worked hard for our success and followed something through to its finish – we even have the medals to prove it. We developed new friendships and strengthened existing ones. We can use this experience and how we dug deep within, mile after mile, to accomplish a goal, and apply it to other tough moments that life throws at us. 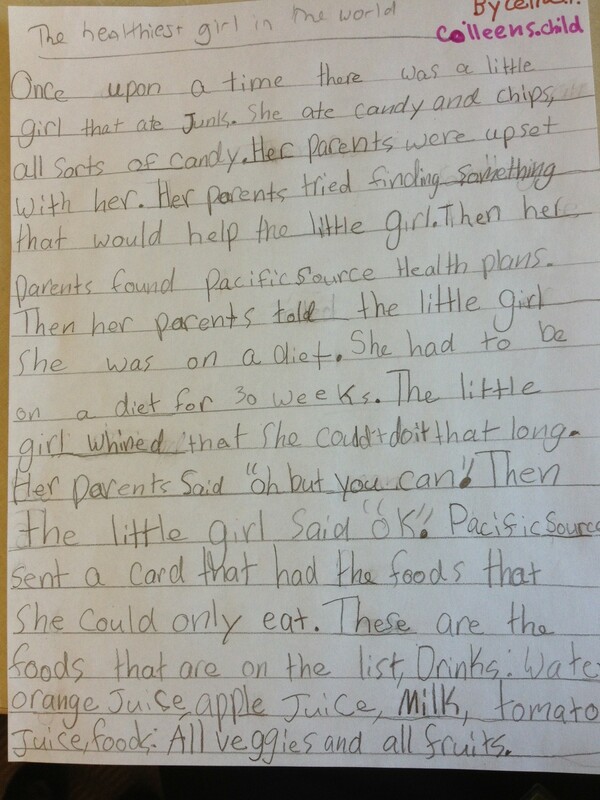 Great work, Celia! You can be a guest blogger anytime! 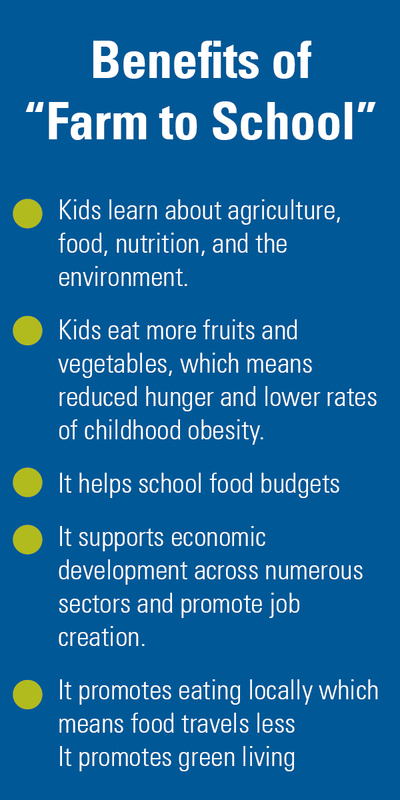 To flourish in the classroom, kids need to maintain a healthy diet. That’s a fact. Considering 46% of Oregon children are receiving free or reduced meals at school, it’s vital that we’re giving these students food that is nutritional so they can function at their absolute best. To help improve students’ overall nutrition, reduce childhood hunger, and prevent obesity among children, many schools are adopting Farm to School programs. At its core, Farm to School is about establishing relationships between local farms and K-12 school aged children. By giving children access to healthy food, while simultaneously benefiting communities and local farmers, Farm to School is a win-win for all. 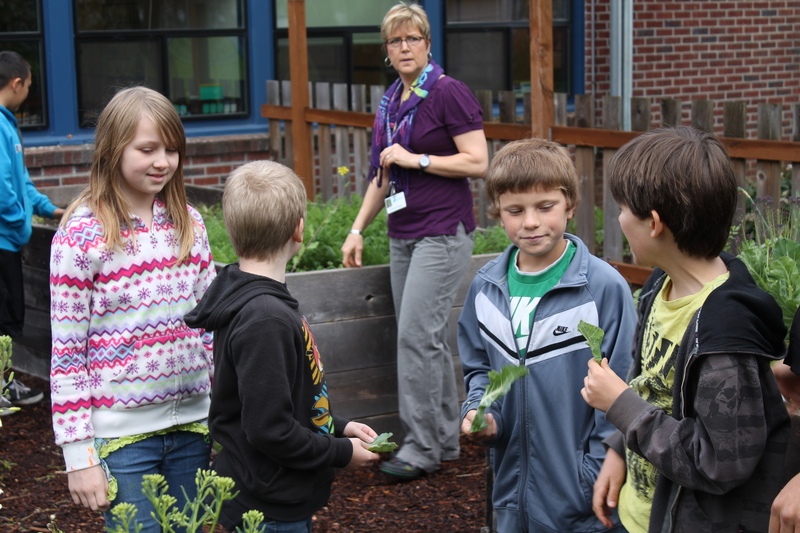 The Bethel School district in Eugene, Oregon has dedicated itself to ensuring that its students be given access to fresh fruits and vegetables that are grown locally. Best of all, they have access to them year round. Bethel’s Farm to School efforts started small. In 2008, Nutrition Services Director, Jennie Kolpak, RD, bought local apples for the school lunch program. That same year, the District (which serves 5,700 students annually) was awarded a grant to fund an educational component of Farm to School. By 2009, Bethel had started a 10-week educational component for second and third graders in two elementary schools. 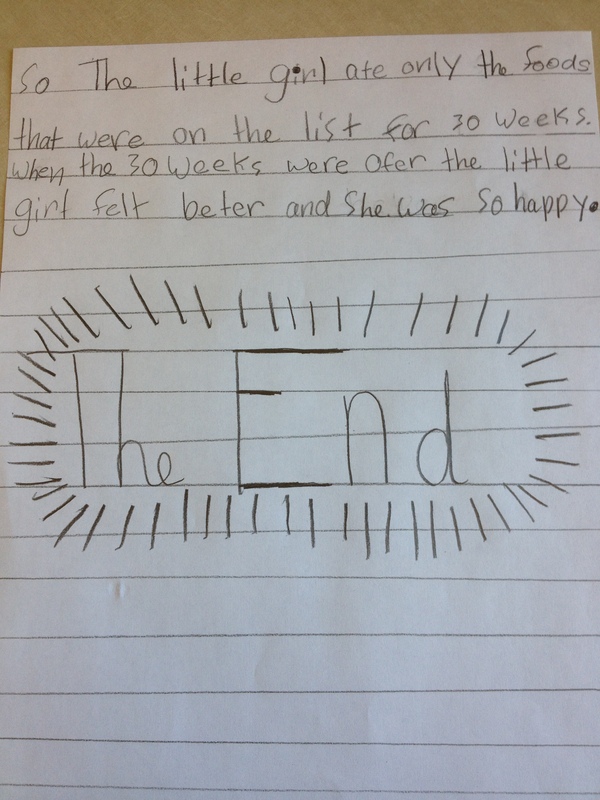 The program was innovative, and it made a direct impact on the health of those students. 30% of Bethel’s produce is procured locally by farm producers and distributors. Students enjoy local apples, berries, carrots, corn, green beans, lettuce, potatoes, milk and eggs, and seven of Bethel’s eleven schools have a school garden. Bethel’s Willamette High School even has a centralized bakery that uses locally grown and milled flour in their baked goods. So, what’s next for Bethel School District? They hope to expand their Farm to School education efforts to all schools in the District, and are considering a “Boat to School” program that would allow them to utilize locally caught seafood in their school lunch program. We’re so thankful for innovative thinkers like the great people working for Bethel. Farm to School is an important way to keep our kids eating well. We’d love to know, what local efforts have you heard of that are driving behavior change in your community?